Alexander Osterwalder’s Business Model Canvas is the tool of choice for a quick, one page dashboard of your business hypotheses. It very much appeals to the business guy in me, but it irks the User Experience (UX) part of my brain. But hey…the canvas is a tool. Use the right tool for the right job. I’m not suggesting the canvas is wrong. It is neither right nor wrong. It’s a paradigm through which you can view your business model. There are many such paradigms available for your to choose. Ash Maurya has his own “lean” canvas, there’s the Balanced Scorecard approach, Getting to Plan B dashboards, etc. These are all just tools. Use the one that helps you. tl;dr This is a fairly detailed follow up of why I’ve modified the BMC for UX focus. You can always skip to the end and I’ve posted a “how to use the business model canvas” example. The first time I saw the canvas I just could not figure out why it was shaped the way it was no matter how hard I looked. Brant Cooper finally had to explain it to me. Production is on the left, customer is on the right, product meets in the middle. Costs are mostly associated with production, so those go under production. Revenue comes from the customer so that’s under the customer. Aren’t distribution channels and customer relationships/support COSTS? Shouldn’t costs be under them as well? Like most English readers I read left to right, so I start looking at the canvas, so why should I start thinking about my business model by focusing on Partners instead of the Customer? Why is Key Partners so damn big? Why can’t I fit my customer persona (which is an 8.5″x11″ piece of paper horizontal) onto the customer block? Of course these questions are a bit unfair and nit picky. Osterwalder does a great job of explaining things step by step in his book Business Model Generation and sure enough…he starts with the Customer, not Key Partners. But I hate reading the f***ing manual and Steve Krug says “Don’t Make Me Think“. So I’m going to tweak this for my own purposes. First nitpick, the customer should be the focus of the canvas. You’re reading this sentence left to right, the canvas is the same. The Business Model Canvas is organized chronologically because it’s made by business people, for business people, and it’s based on a supply chain. You negotiate with your your suppliers (a.k.a Key Partners) to purchase raw materials (a.k.a. Key Resources) and then transform them via your manufacturing process (a.k.a Key Activities) into a product (a.k.a Value Proposition) which is then delivered via Channels to the Customers. …but I don’t really came about chronology here. I’m trying to think out what I need to produce my Value Proposition. So I want to start left to right. Now when filling this out I’m going to start (as Osterwalder does) with Customer (“Who am I trying to help?”) and work my way towards the Value Proposition (“What does the customer want?”) Only then will I figure out how to produce that value. Here we have the Value Proposition (product) delivered via Channels to the Customers. Strangely, we also have Customer Relationships being delivered by a similar arrow to the Customer. This makes sense if you consider Customer Support as a value you deliver to the Customer. That’s fair. In the early stages of product development, Steve Blank tells us to get out of the building and talk to customers. Eric Ries also emphasizes the Build-Measure-Learn loop as a means of getting feedback from real user behavior and improving on our Value Proposition. So where’s the Build Measure Learn loop in this picture? As suggested by Osterwalder, it’s true that your customer relationship might be community based and very hands off like Google. (I dare you to try and get a Googler on the phone to help you with you gmail account.) So the Canvas supports that view of the world. So I want to make sure that my business model constantly emphasizes getting feedback from the Customer to my Value Proposition. So let’s flip that arrow. Now whenever I look at my canvas and think about Customer Relationships I’m going to be thinking about it as a feedback loop to the Value Proposition. There are a few things here that get in the way of my thinking. First, Key Activities and Key Resources are visually coupled with Key Partners, but not with each other. That’s a bit weird since you need Resources to perform some Activities. Second, the Key Partners is huge box and I never wind up with enough real estate in Key Activities or Key Resources. 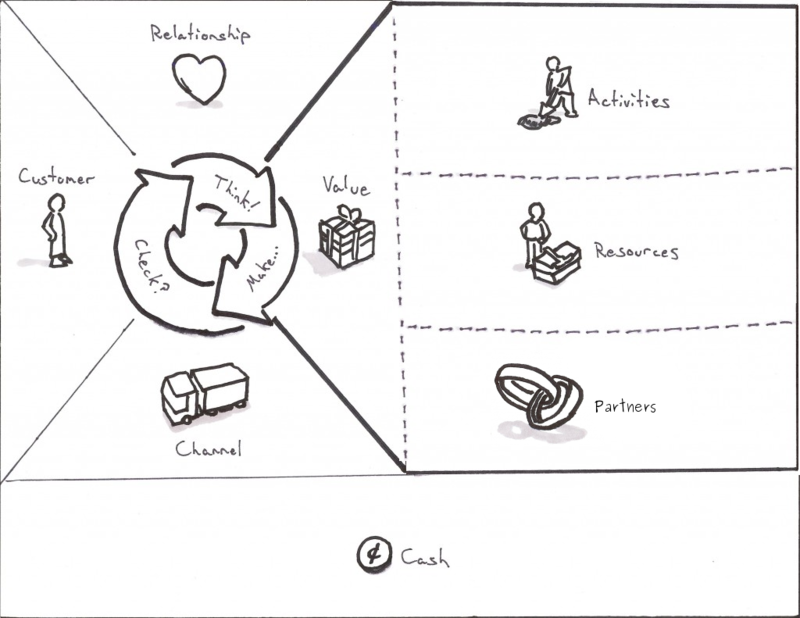 Finally, why neither Activities nor Resources is visually linked to Value Proposition, I will never understand. What Key Activities does someone need to perform in order to produce my Value Proposition? What Key Resources are required as an input to those Key Activities? What Key Partners might perform some of the Key Activities or provide Key Resources instead of my company directly? I work backwards from the Value Proposition step by step and construct a very basic production line of Key Activities with yellow sticky notes. Then I can just use another row of sticky notes underneath to note the Key Resources and Key Partners I need underneath that production line. From this perspective, it turns out Key Partners are really just Key Resources. So let’s just remove Key Partners all together and make some new shapes to more strongly stress the production nature of this quadrant. Now I have plenty of space and a visual queue making my eyes goes back to the left towards the Value Proposition and the Customer. But there’s a little more to be done. The separation of Cash and Costs makes a lot of sense from a hypothesis perspective. I’m tempted to keep these as two separate boxes. But I am admittedly mentally lazy here. I need a visual queue to associate my Costs with various components of the business model and the biggest Cost that most entrepreneurs forget is the Cost of Customer Acquisition…a.k.a Channels. Costs and Revenues should be directly and visually associated with the aspects of the Business Model that create them. So let’s just finish this off by making one big box for Costs and Revenues. That way I can just drop cost or revenue directly underneath each box that might impact Cost or Revenue. This way I’ll remember to account for costs of Customer Relationships as well as Channels. If I’m lucky, maybe this will even get me thinking about some nice way of adding a Revenue Stream from a Key Partner (now listed under Key Resources) or Key Activity. This suits me pretty well, but when I look at it as I’ll use it, in 2D and heavily simplified, there are still some issues. So let’s do one final tweak to get something useable and just for good measure, let’s shove in a Think-Make-Check loop (same thing as Build-Measure-Learn) as long as we’re doing this for User Experience peeps. Now we have a Business Modal Canvas which starts with the Customer. As we fill out the pieces, we’re forced to think about how we are building our Think-Make-Check loop (or Build-Measure-Learn if you prefer) into the Business Model itself. We also have a strong visual queue in the form of a massive arrow drawing our eyes back to the Customer as we think about production. That was admittedly a lot of work for something relatively academic, but it’ll let me explain some (im)practical applications faster in the next few posts where I explain how to create a Business Model Canvas for Renting Puppies. Post update: there is newer post on the Product/Market Fit Storyboard here. I really LOVE the changes you made, this way I find it a lot more intuitive and easy to remember (this one is very important to me :), I would also change the word “Relationship” to something more towards brand experience, or something else to make it broader, something about the perception the customer has of your company and not about how your company wants to see the customer. In the way I like to see a business I wouldn’t combine costs and revenue, because understanding your “economic engine” may be very important, think of a Yahoo vs Google, the difference between their economic engines was not based on their Relationship or Customer Acquisition, it was based on the cost of their activities and I personally find easier to understand my economic engine viewing my cost structure vs my revenue stream (if possible), this way I may decide which customer segments should I focus on, for example, or change your price strategy (think Gillete here). I think I agree with you on the Cash box. It may make sense to me to combine them, but the whole canvas should be a cognitive queue. So if two boxes make for a good trigger, then it should be two boxes. Perhaps it should be two boxes stacked on one another so that you can still visually align each Cost and Revenue underneath the canvas item that it corresponds to. I’m also wondering if there should be differentiation between fixed and variable costs or not. Not sure on the Relationship terminology. I take Relationship to mean, “By what means does your Customer communicate and maintain a relationship with the company” I don’t want it to be about perceptions. I want it to be about feedback and communication. Wait…you mean UX isn’t just a feature you add to the product at the end? Would love to see a two-sided market account! But would you still tackle one market first based on it’s a riskier hypothesis? B-M-L loop this way is awesome FTW. Cool thanks!…the example use I’m writing can be a two sided market, but yes I’d still try to tackle one side first and fake the other side. Very interesting! Your modification of the BMC makes sense to me. I like it to have centralized the customer focus on the canvas. For the two sided business model you perfectly can add an extra customer focus box on the right side of the canvas. Then you can easily see what the effect will be of changes in activities and resources for both sides. Sometimes it works and sometimes it’s better to put them on top of one other. I haven’t used it in enough cases to say which works more consistently. Stacked seems to reveal some synergies sometimes particularly if you are listing the activities in reverse chronological order. You sometimes find you can put the same activities underneath one another and then you’ve found a nice synergy. Dropping down costs at that point, you only have one. I really like what you’ve done to the canvas, and the way you presented your thinking and changes in your post. I TOTALLY agree with the need to put customer first, and it’s one of the most important things I do when I use this tool. I like the addition of Alternatives on yours. That’s an interesting thing to ponder. The personas we create often have this information embedded, but it’s not so explicit. It is amazing how your first proposed change – flipping the BMC – impacts the whole approach. I work for a company that operates on the manufacture->sell model. Few years ago we started offering services, and this is a growing business nowadays. The effort required to make people see the difference between a customer oriented and a manufacturing oriented model is huge, and your explanation will help me a lot. Great thinking! Thank you very much. Thanks Fernando! Yes…a big difference from a small change. Good luck! Great stuff about turning the BMC around. It’s so simple and elegant. I was considering to think about it myself, but you just took away the necessity. I am going to give a talk about combining the BMC and UX and I was wondering if it’s okay if I add your model to the talk (of course with the necessary references)? Thanks for such a practical explanation of the BCM, and for your thoughts on restructuring this. I am relatively new to business models, and feeling daunted by the many elements of the business canvas and how to approach it, i found this article very useful in thinking about the model and how to apply it in a systematic way. I also echo your comments about partners and resources, as i ended up with similar answers in each box which was confusing. Also found your worked example, and information on developing the customer persona extremely helpful in understanding how to start mapping out the customer. You made my day here. I am giving a public speech soon about the innovation opportunities that companies can unleash by leveraging the “Customer Relationship” and “Channels” blocks. Your flipped BMC and flipped “Customer Relationship” arrow would help me explain much better my ideas. I am wondering if I can include your sketches in my Prezi (mentioning you of course!). Of course! Please feel free to share or modify. Everything is CCed under the Osterwalder license so please make sure to credit him. Credited both him and you. Thank you for your quick feedback. Agree with comments, excellent changes. Consistent with Deming cycle and lean start up. I have adapted this approach into a mindmap that I use with clients. They love the interactive mindmap format together with the intuitive business canvas structure. Happy to share with others if interested. Mike, I’d love to hear it. I actually have modified my canvas further. I will do a follow up post shortly. I’m doing some work on a new business model. Hi Tristan, I like your analysis over BMC. I want to ask your opinion about a tool I built recently, http://www.CanvasBM.com I made it simple without any colours or icons. I think the user should already know what are each canvas boxes mean when he starts actually creating one. There are a ton of tools to make digital BMCs, but a piece of paper is still better for many reasons. I was experimenting today with your new canvas and find out somehing that could be improved.. Instead of removing the ‘partners’ section, you can stack it over (or under) the tasks. That way, you remove the gray unused parts of the diagam (space gain) and also reminds you to add some details that otherwise could forget. Also, you can line the partners underneath to the key resource they provide underneath the key activity that it’s being fullfilled. Right on top on how much is costing you. I noticed that you interchange “cash” (or cash-flow) with “revenue” and “cost” in between your drawings and your BMC-UX template. Which is more important to think about when you’re in the early phases of finding customers and testing your business model? I don’t have a blanket answer for that. Some businesses innovate on the cost side of things. A cheaper way to manufacture graphene better focus on the cost side of things. If we’re a SaaS business and the cost per users is going to be negligible, then focusing on revenue makes more sense. One cost that I think we always need to keep in mind is customer acquisition cost. In B2C or B2B (think about the fixed cost of sales people)….CAC can be a killer. To use Business Model Canvas, you should try BlankCanvas that is preloaded with this and other canvases.